This tutorial shows how to create a SQL Server Always On Availability Group on Azure Virtual Machines. 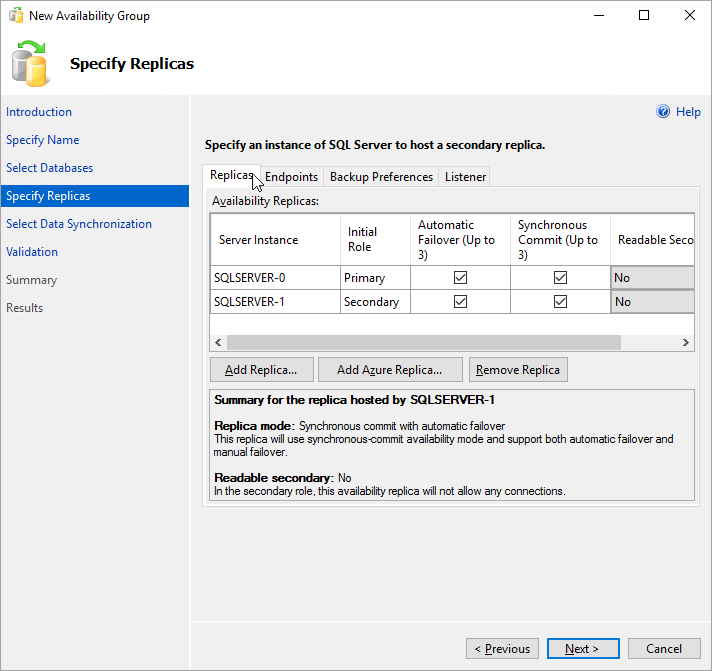 The complete tutorial creates an Availability Group with a database replica on two SQL Servers. Time estimate: Takes about 30 minutes to complete once the prerequisites are met. The diagram illustrates what you build in the tutorial. The tutorial assumes you have a basic understanding of SQL Server Always On Availability Groups. 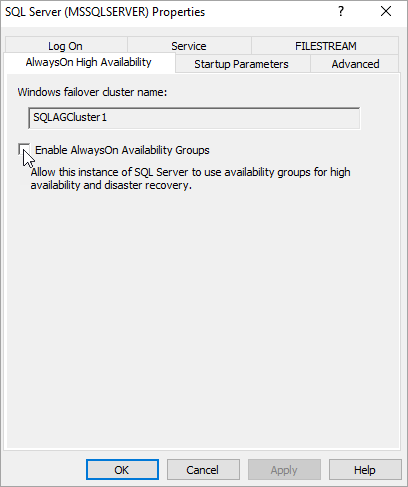 If you need more information, see Overview of Always On Availability Groups (SQL Server). Before you begin the tutorial, you need to Complete prerequisites for creating Always On Availability Groups in Azure Virtual Machines. If these prerequisites are completed already, you can jump to Create Cluster. Many of the steps provided in this tutorial can now be automated with Azure SQL VM CLI and Azure Quickstart Templates. After the prerequisites are completed, the first step is to create a Windows Server Failover Cluster that includes two SQL Severs and a witness server. RDP to the first SQL Server using a domain account that is an administrator on both SQL Servers and the witness server. 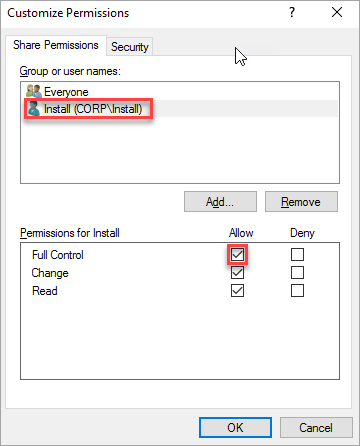 If you followed the prerequisites document, you created an account called CORP\Install. Use this account. In the Server Manager dashboard, select Tools, and then click Failover Cluster Manager. 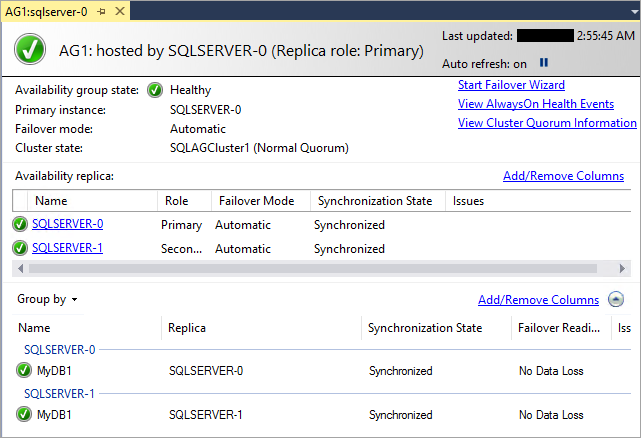 In the left pane, right-click Failover Cluster Manager, and then click Create a Cluster. Select Servers Type the first SQL Server name in Enter server name and click Add. Access Point for Administering the Cluster Type a cluster name, for example SQLAGCluster1 in Cluster Name. Confirmation Use defaults unless you are using Storage Spaces. See the note following this table. 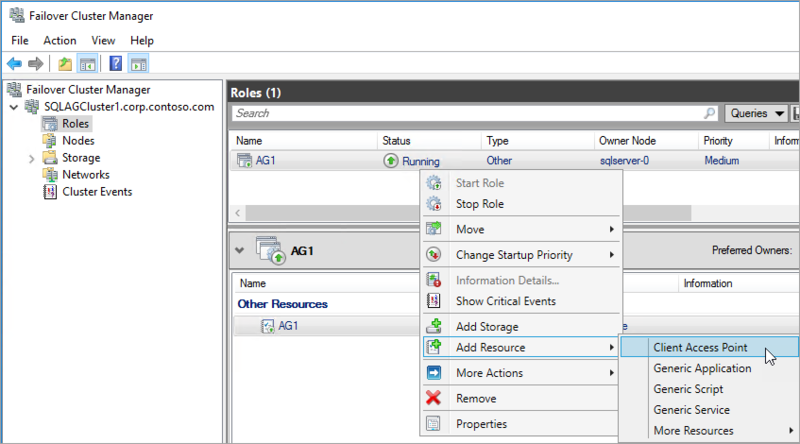 In Failover Cluster Manager, scroll down to Cluster Core Resources and expand the cluster details. You should see both the Name and the IP Address resources in the Failed state. 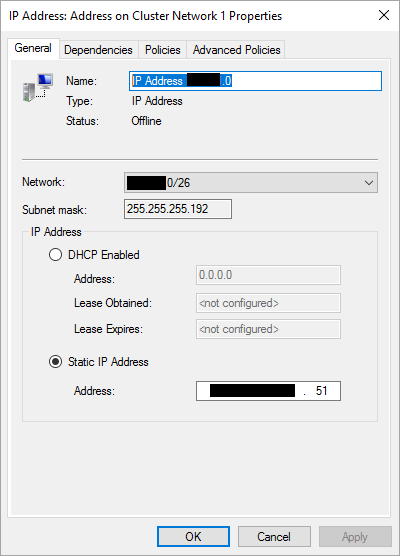 The IP address resource cannot be brought online because the cluster is assigned the same IP address as the machine itself, therefore it is a duplicate address. Right-click the failed IP Address resource, and then click Properties. Select Static IP Address and specify an available address from the same subnet as your virtual machines. 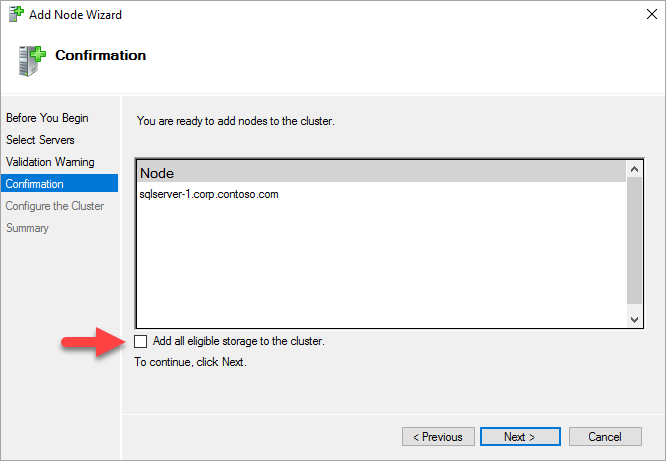 In the Cluster Core Resources section, right-click cluster name and click Bring Online. Then, wait until both resources are online. When the cluster name resource comes online, it updates the DC server with a new AD computer account. Use this AD account to run the Availability Group clustered service later. Add the other SQL Server to the cluster. In the browser tree, right-click the cluster and click Add Node. In the Add Node Wizard, click Next. In the Select Servers page, add the second SQL Server. Type the server name in Enter server name and then click Add. When you are done, click Next. In the Validation Warning page, click No (in a production scenario you should perform the validation tests). Then, click Next. 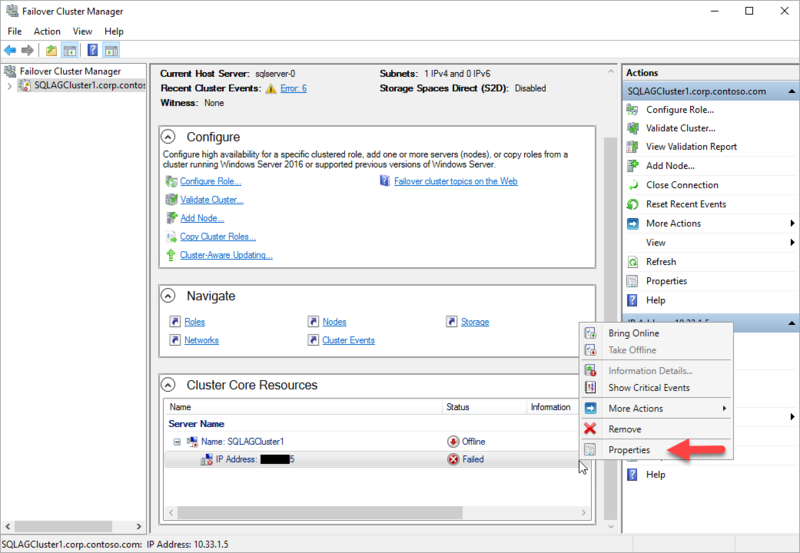 In the Confirmation page if you are using Storage Spaces, clear the checkbox labeled Add all eligible storage to the cluster. If you are using Storage Spaces and do not uncheck Add all eligible storage to the cluster, Windows detaches the virtual disks during the clustering process. As a result, they do not appear in Disk Manager or Explorer until the storage spaces are removed from the cluster and reattached using PowerShell. Storage Spaces groups multiple disks in to storage pools. For more information, see Storage Spaces. Failover Cluster Manager shows that your cluster has a new node and lists it in the Nodes container. Log out of the remote desktop session. In this example the Windows cluster uses a file share to create a cluster quorum. This tutorial uses a Node and File Share Majority quorum. For more information, see Understanding Quorum Configurations in a Failover Cluster. Connect to the file share witness member server with a remote desktop session. On Server Manager, click Tools. Open Computer Management. 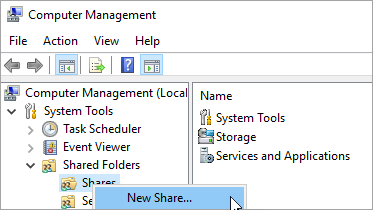 Use Create a Shared Folder Wizard to create a share. On Folder Path, click Browse and locate or create a path for the shared folder. Click Next. In Name, Description, and Settings verify the share name and path. Click Next. Make sure that the account used to create the cluster has full control. In Shared Folder Permissions, click Finish. Click Finish again. Next, set the cluster quorum. Connect to the first cluster node with remote desktop. 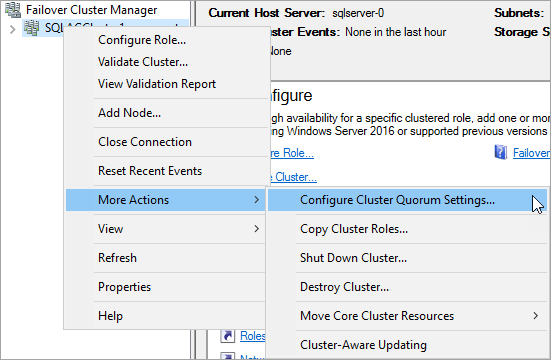 In Configure Cluster Quorum Wizard, click Next. In Select Quorum Configuration Option, choose Select the quorum witness, and click Next. 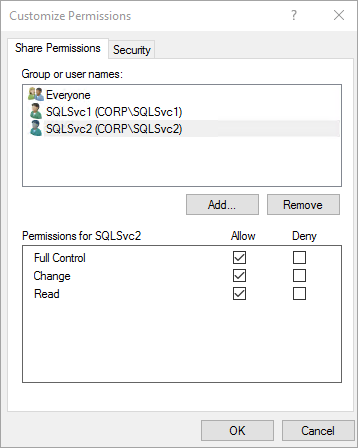 On Select Quorum Witness, click Configure a file share witness. Windows Server 2016 supports a cloud witness. If you choose this type of witness, you do not need a file share witness. For more information, see Deploy a cloud witness for a Failover Cluster. This tutorial uses a file share witness, which is supported by previous operating systems. On Configure File Share Witness, type the path for the share you created. Click Next. Verify the settings on Confirmation. Click Next. The cluster core resources are configured with a file share witness. Next, enable the AlwaysOn Availability Groups feature. Do these steps on both SQL Servers. From the Start screen, launch SQL Server Configuration Manager. In the browser tree, click SQL Server Services, then right-click the SQL Server (MSSQLSERVER) service and click Properties. Click Apply. Click OK in the pop-up dialog. 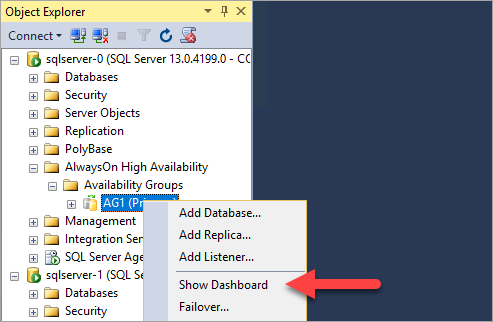 Repeat these steps on the other SQL Server. Launch the RDP file to the first SQL Server with a domain account that is a member of sysadmin fixed server role. Open SQL Server Management Studio and connect to the first SQL Server. In Object Explorer, right-click Databases and click New Database. In Database name, type MyDB1, then click OK.
On the first SQL Server in Server Manager, click Tools. Open Computer Management. On Folder Path, click Browse and locate or create a path for the database backup shared folder. Click Next. Make sure that the SQL Server and SQL Server Agent service accounts for both servers have full control. You need to back up the new database to initialize the log chain. If you do not take a backup of the new database, it cannot be included in an Availability Group. In Object Explorer, right-click the database, point to Tasks..., click Back Up. Click OK to take a full backup to the default backup location. Create a database on the first SQL Server. On remote desktop session to the first SQL Server. 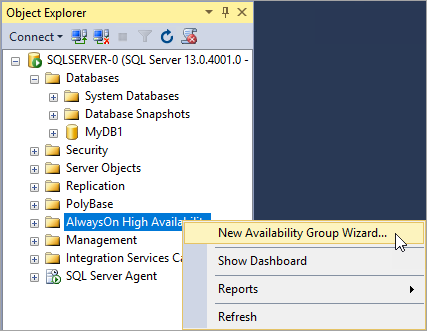 In Object Explorer in SSMS, right-click AlwaysOn High Availability and click New Availability Group Wizard. In the Introduction page, click Next. 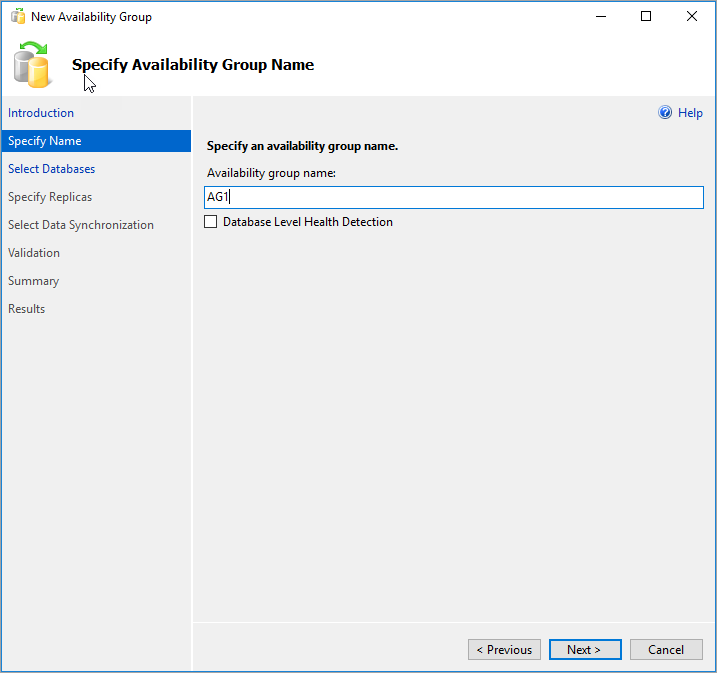 In the Specify Availability Group Name page, type a name for the Availability Group, for example AG1, in Availability group name. Click Next. In the Select Databases page, select your database and click Next. 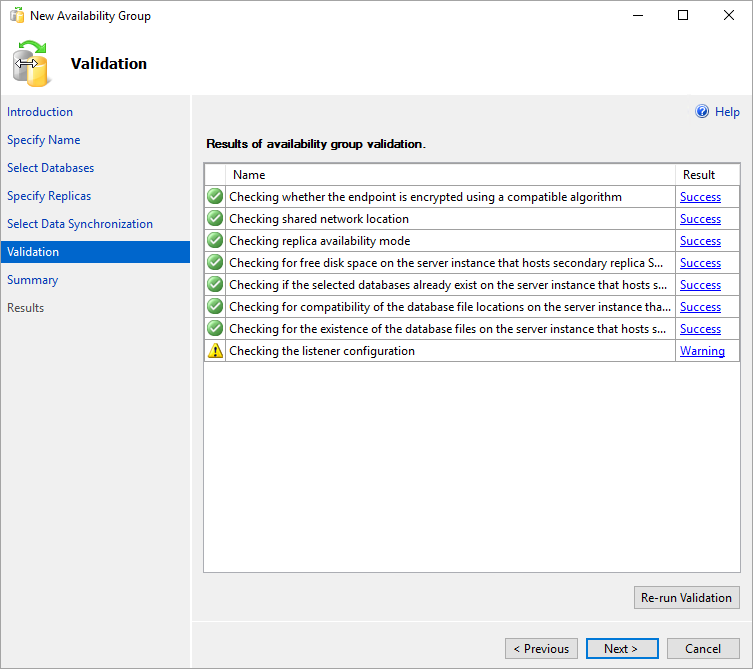 The database meets the prerequisites for an Availability Group because you have taken at least one full backup on the intended primary replica. In the Specify Replicas page, click Add Replica. The Connect to Server dialog pops up. Type the name of the second server in Server name. Click Connect. Back in the Specify Replicas page, you should now see the second server listed in Availability Replicas. Configure the replicas as follows. Click Endpoints to see the database mirroring endpoint for this Availability Group. Use the same port that you used when you set the firewall rule for database mirroring endpoints. In the Select Initial Data Synchronization page, select Full and specify a shared network location. For the location, use the backup share that you created. In the example it was, \\<First SQL Server>\Backup\. Click Next. 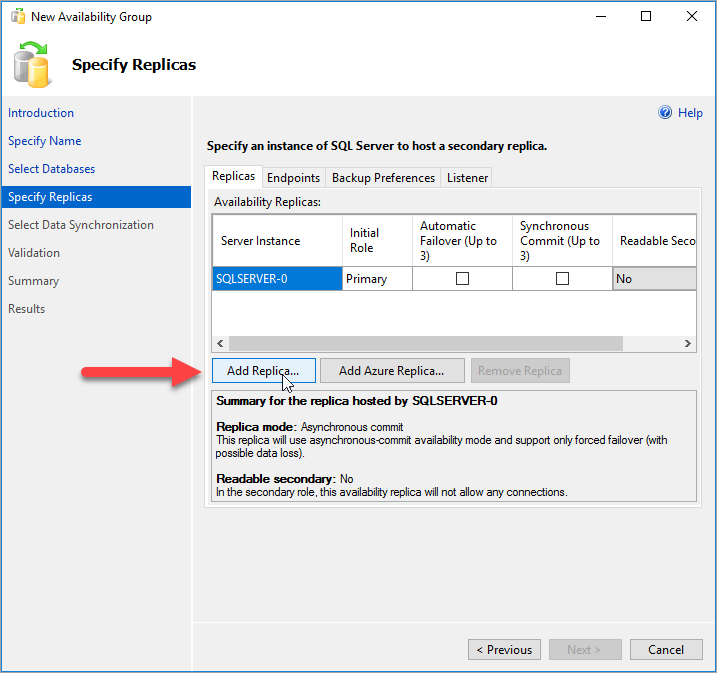 Full synchronization takes a full backup of the database on the first instance of SQL Server and restores it to the second instance. For large databases, full synchronization is not recommended because it may take a long time. You can reduce this time by manually taking a backup of the database and restoring it with NO RECOVERY. 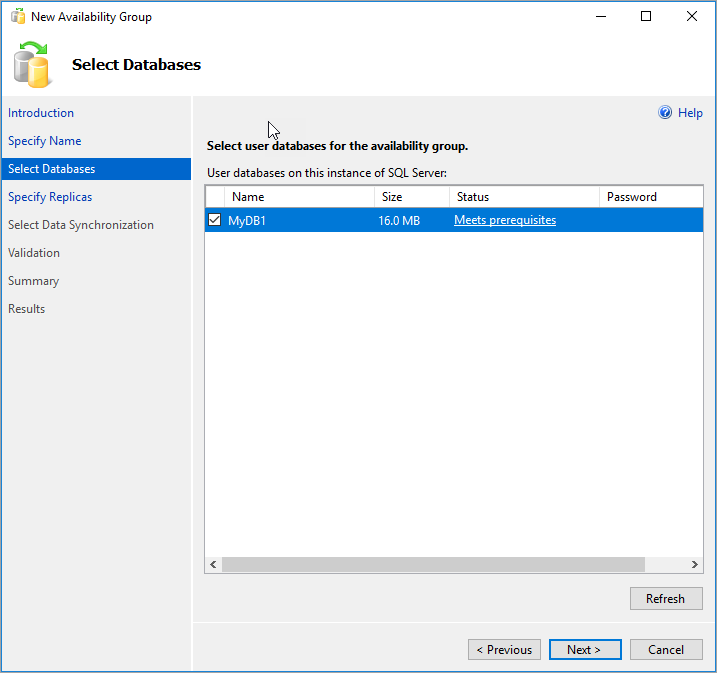 If the database is already restored with NO RECOVERY on the second SQL Server before configuring the Availability Group, choose Join only. 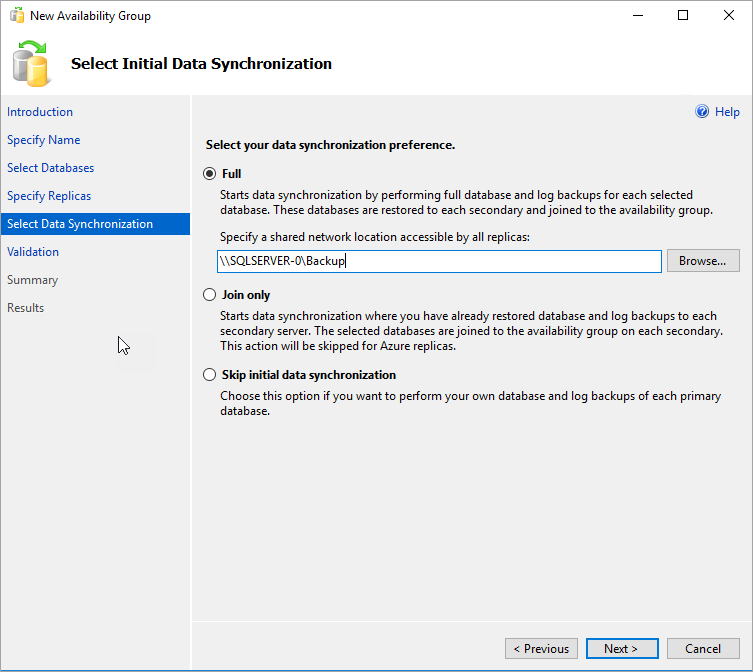 If you want to take the backup after configuring the Availability Group, choose Skip initial data synchronization. There is a warning for the listener configuration because you have not configured an Availability Group listener. You can ignore this warning because on Azure virtual machines you create the listener after creating the Azure load balancer. In the Summary page, click Finish, then wait while the wizard configures the new Availability Group. In the Progress page, you can click More details to view the detailed progress. 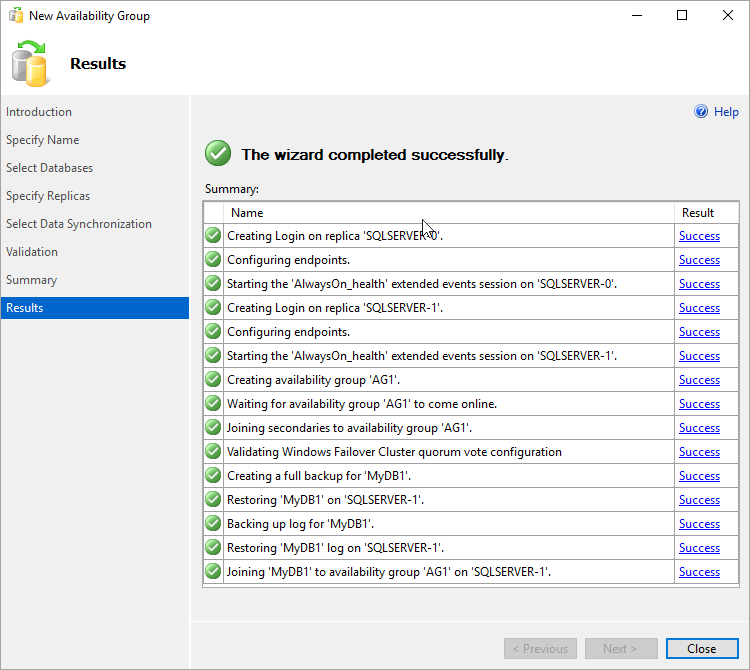 Once the wizard is finished, inspect the Results page to verify that the Availability Group is successfully created. 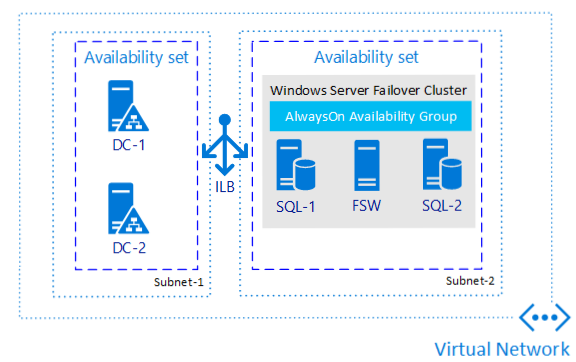 In Object Explorer, expand AlwaysOn High Availability, then expand Availability Groups. You should now see the new Availability Group in this container. Right-click the Availability Group and click Show Dashboard. Your AlwaysOn Dashboard should look similar to this. You can see the replicas, the failover mode of each replica and the synchronization state. 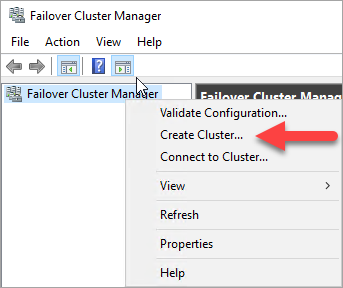 In Failover Cluster Manager, click your cluster. Select Roles. 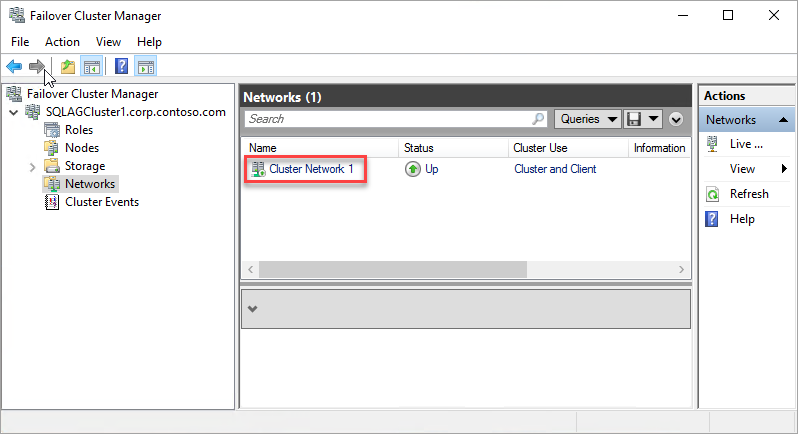 The Availability Group name you used is a role on the cluster. That Availability Group does not have an IP address for client connections, because you did not configure a listener. You will configure the listener after you create an Azure load balancer. Do not try to fail over the Availability Group from the Failover Cluster Manager. All failover operations should be performed from within AlwaysOn Dashboard in SSMS. For more information, see Restrictions on Using The Failover Cluster Manager with Availability Groups. At this point, you have an Availability Group with replicas on two instances of SQL Server. You can move the Availability Group between instances. You cannot connect to the Availability Group yet because you do not have a listener. In Azure virtual machines, the listener requires a load balancer. The next step is to create the load balancer in Azure. On Azure virtual machines, a SQL Server Availability Group requires a load balancer. The load balancer holds the IP addresses for the Availability Group listeners and the Windows Server Failover Cluster. This section summarizes how to create the load balancer in the Azure portal. An Azure Load Balancer can be either a Standard Load Balancer or a Basic Load Balancer. Standard Load Balancer has more features than the Basic Load Balancer. For an availability group, the Standard Load Balancer is required if you use an Availability Zone (instead of an Availability Set). For details on the difference between the load balancer types, see Load Balancer SKU comparison. In the Azure portal, go to the resource group where your SQL Servers are and click + Add. Search for Load Balancer. Choose the load balancer published by Microsoft. Configure the following parameters for the load balancer. Name Use a text name for the load balancer, for example sqlLB. Virtual network Use the name of the Azure virtual network. Subnet Use the name of the subnet that the virtual machine is in. IP address Use an available address from subnet. Use this address for your availability group listener. Note that this is different from your cluster IP address. Subscription Use the same subscription as the virtual machine. Location Use the same location as the virtual machine. Click Create, to create the load balancer. To configure the load balancer, you need to create a backend pool, a probe, and set the load balancing rules. Do these in the Azure portal. In the Azure portal, go to your availability group. You might need to refresh the view to see the newly created load balancer. Click the load balancer, click Backend pools, and click +Add. Associate the backend pool with the availability set that contains the VMs. Under Target network IP configurations, check VIRTUAL MACHINE and choose both of the virtual machines that will host availability group replicas. Do not include the file share witness server. If both virtual machines are not specified, connections will only succeed to the primary replica. Click OK to create the backend pool. Click the load balancer, click Health probes, and click +Add. Click OK to set the health probe. Click the load balancer, click Load balancing rules, and click +Add. Set the listener load balancing rules as follows. Frontend IP address Choose an address Use the address that you created when you created the load balancer. Direct server return is set during creation. It cannot be changed. Click OK to set the listener load balancing rules. The WSFC IP address also needs to be on the load balancer. In the portal, on the same Azure load balancer, click Frontend IP configuration and click +Add. Use the IP Address you configured for the WSFC in the cluster core resources. Set the IP address as static. On the load balancer, click Health probes, and click +Add. Set the load balancing rules. Click Load balancing rules, and click +Add. Set the cluster core IP address load balancing rules as follows. Click OK to set the load balancing rules. The next thing to do is to configure an Availability Group listener on the failover cluster. This tutorial shows how to create a single listener - with one ILB IP address. To create one or more listeners using one or more IP addresses, see Create Availability Group listener and load balancer | Azure.